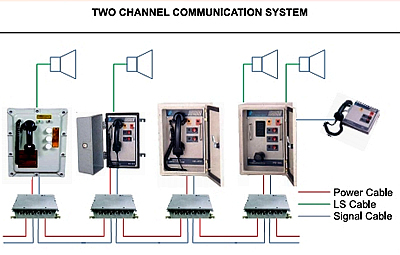 A two channel distributed / centralized amplification system providing loudspeaker for page and handset for private line communication in industrial / hazardous environments, and in regions of extreme temperature, noise, dust and humidity. Provided with two independent and simultaneous channels of communication. The selection of the announcement is through the “Press to Page Switch”, for announcement over all the loudspeakers. A call attention tone automatically precede paging announcement. The party channel is to hold conversation in private mode, without being heard over the loudspeakers. A “Press to talk” switch is provided for party communication. To originate a call, the caller from his field station, operates the “Press to Page” switch. A “Call attention” tone is relayed over all the loudspeakers, followed by an announcement. The called person through nearest station, communicates on the party line. The system being an open line configuration, other station can join in a conference. The page channel is free for announcement. In case the page announcement is disturbing, those engaged in party communication can mute the loudspeakers by pressing the “L.S.Mute” switch. When the ‘party line is in use, an LED glows at all the stations, indicating that the ‘party line is ‘BUSY’. Indoor wall/column mounting handset station. Outdoor wall/column mounting handset station. Simultaneous communication on two channels. ‘State-of-the-art’ electronics technology using hi-tech devices and IC’s to maximize performance, MTBF, durability, dependability. Conforms to IS standards and intrinsically safety standards. Simplified operation, easy installation and maintenance. Designed for use in regions of extreme temperatures, noise, dust, humidity and corrosive atmospheric conditions. Different alert, siren and test tones with visual indication. Anti-side Tone control circuitry, AGC for clarity and intelligibility of speech. Special design for fewer cable cores leading to cost saving. Idle time power cut off.